Welcome to A.P.E. 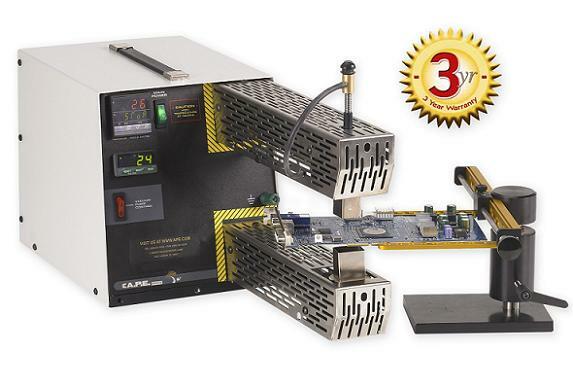 | World leader in surface mount repair equipment. Founded in 1968, Automated Production Equipment (A.P.E.) introduced rework and repair equipment to a growing worldwide electronics community. Now, more than 40 years later, the industry has changed beyond recognition. Denser packaging, RF shields, flex circuits, CSP’s / uBGA’s plastic odd forms, area array packages, pin grid arrays, ceramic chips, and the constant demand for greater throughput, have pushed rework equipment to new standards. APE has met and surpassed these standards for the past 18 years with our patented thermal convection rework systems. Our unique technology uses high power and low temperature to reproduce precisely the original manufacturing process. A.P.E. continues to lead the way in designing innovative rework and repair systems to meet industry demands. We were first, for example, to recognize the necessity of cost-effective Low-Temperature, Hot-Air solutions for BGA/CSP/SMT Packages. If you’re interested in repairing printed circuit boards, this site provides in-depth technical documentation and procedures for APE’s rework and repair products. It details our Split Vision, Micro BGA, CSP (Chip Scale Package) and plastic and ceramic BGA applications, together with SMT, (Surface Mount Technology) and traditional thru-hole desolder technology.